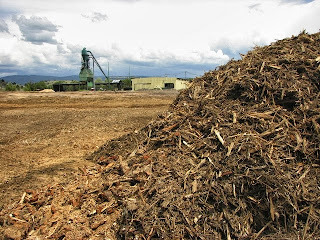 Biomass in general has a large volume so it is not efficient in transporting and handling. So as to resolve the issue needs to be compressed in volume of biomass by means of a press machine. Application of pressure especially with the high temperatures make the biomass will be compressed and strong glue. The compression will make solid fuel which has a higher energy density per volume is the same. In general, this way no longer needed extra adhesive from the outside, because lignin compounds in the biomass that will act as a binder. Pellet is currently produced by large-scale and large users while briquettes are generally produced on a smaller scale and its not as much as pellets. Both pellets and briquettes made ​​from hardwood and softwood. At a glance we can distinguish pellets and briquettes based on its dimensions. Smaller sized pellets with a diameter of about 10 mm while the larger sized briquettes with a size of about 50 to 100 mm with a length of typically 60 to 150 mm and even larger. Biomass fuels has gained the attention and interest as environmentally friendly (almost zero sulfur content) and including renewableenergy. Application of biomass pellets and briquettes for household fuel to industries. Energy content is the critical point for a number of users. For example, the high calorific value could create higher combustion temperatures and potentially damage the furnace. Used pellet and briquette exports need to be sampled and tested to ensure the applicable standards. Wood briquettes or Synthetic Logs or Uncarbonized Briquette is different from charcoal briquettes, because the raw material of wood briquette is biomass (usually sawdust) that are not charred / carbonized or physically resembles wood pellets only bigger. As a carbon neutral fuel because it comes from biomass, pellets and briquettes are alternative heating fuel to coal heating and boiler which could be used for a variety of modern combustion systems. As fuel both briquettes and pellets is comparable with coal in terms of energy content, and offers a variety of gas emission reductions of NOx and SOx and low ash content. In a number of countries in Europe and America, pellet and briquette fuels is becoming more popular these days because of the urge to use renewable and environmentally friendly fuel.